Are you someone who wants to have your own job board, but doesn't want a heavy bloated system entangled with code that you don't understand? This theme contains all the pages and styles you need to create your own simple to use, good looking and user friendly job board. 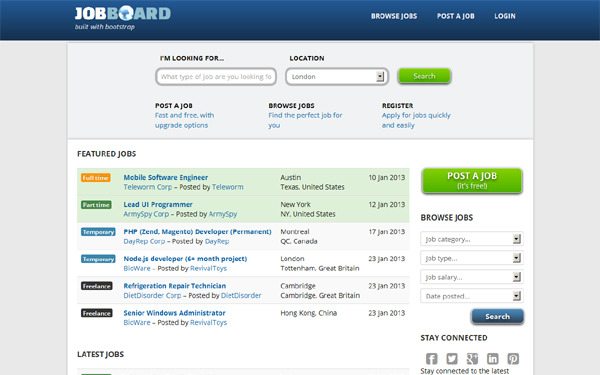 The Bootstrap Job Board theme contains all the pages required for a job board. There are pages for you to post a job, allow users to upload CVs, view jobs, view applicants, edit jobs and more. It even includes dashboard pages for recruiter accounts help manage their applicants. All pages are designed for simplicity for both employers and employees. For those of you who wants to use existing scripts, the structure of the theme maintains a similarity to popular availiable job boards scripts, such as jobberbase and WP jobroller. It's also compatible with all bootswatch themes (http://bootswatch.com/), therefore making it really easy to add your own swatches. We've included the LESS files - making it very easy to change. You can also easily add and remove components as it's 100% based on the bootstrap framework. If you have any problems please contact us at admin@appsarea.com.